I was still billed even though I had canceled the subscription within their 24 hour stated policy. Vendor does not provide any confirmation of subscription cancellation. Only used the app 1 time to see what it was like, meals were limited, still billed even after I canceled the subscription. So I like the concept and love the idea but I found inaccuracies. For example, Amanda’s antioxidant shake is the same as cam’s athletic greens shake, it has identical ingredients and the calories are 466 and 230 respectively. The 466 is inaccurate, and for someone who is depending on this accuracy it’s hard to trust now. Also the chicken soup calls for chicken broth in the video but in the grocery items it says water and not broth. And ingredients are missing. So when I went to the grocery and bought the items I realized upon watching the video I was missing items. These inaccuracies makes customers distrust the product and wish that there was a QA on this app who would double triple check the ingredients, calories, and portion count to be accurate. I was interested after seeing the ads. But the app feels dated and clunky. The meals are the same everyday. Not worth paying for it. I used the app on trial for a day and then decided I didn’t want to use it and forgot about it. I should’ve cancelled there. Two weeks later, I was charged for an entire year. It didn’t throw me on monthly renewal or anything, they charged me for the maximum they could and now “my refund request does not meet” their criteria. I’ve really enjoyed this meal prep app! It makes it super easy to reach your macro numbers while offering ideas for foods, recipes, and how-tos! I was excited when I saw the "vegan" meal plan option; however, they aren't actually vegan at all. Vegan means no animal products at all, and their "vegan" recipes still include eggs and dairy. Let down for sure. I bought the app and I stop using for a few months now that I’m back to try recipes everything is lock because I have to pay for everything.. not good!!! For someone who loves to cook but struggles to find healthy variations or lacks knowledge to be creative while still eating healthy. I absolutely love the macros that are included and how you can modify any recipe to adjust for number of servings. Also neat that you can transfer items from a recipe (all or select ingredients) to a grocery list. Only recommendation is to adjust macros for removed items. So in the beginning to get this app you could only buy it. Which I did And now i am seeing all recipes blocked because I need to pay monthly again What kind of trick is this? This app is pretty good, but I have some complaints. 1. some ingredient lists and/or the recipe are missing items. for example, the recipe won’t call for eggs, then the directions say “add eggs.” okay... how many? are the macros still correct? 2. WHY CANT WE IMPORT TO MYFITNESSPAL 3. grocery list imports are faulty. some recipes are designed to last the week, some are for one meal. because one of my “snack” preps was for the week, I ended up accidentally buying 30 pounds of carrots. I’ve been using this app since the new release and I’ve had the opportunity to try meals by all the trainers and they all have been phenomenal! I have found unique and awesome ways to make food more natural and healthy and have learned sooo much about preparing food in a better way and super tasty recipes that don’t leave me feeling gross like processed food does. I look forward to my meals and having control over what I put in my body! The app was fairly easy to coordinate. I think for what it offers you can find the same things for free online or through other apps. It basically felt like an app for recipes. Not so much a meal plan guide to follow. Thank you so much for having this meal plan app as an option. I have for years needed something like this to follow that is reasonably priced as well. I love that you can use several recipes and mix and match. Thanks meal plan app!!! I LOVE this app! I love having all my meals prepared for the week and they are delicious 😋. Only issue is that sometimes things don’t match up; ex. Black bean burger but, no black beans on the grocery list 🤷🏼‍♀️. I’ve come across this a few times now, really my only issue with the app. I just thoroughly look over every recipe before I go shopping. I like the fact that I am learning to cook healthy food however, the recipes are not accurate. For example, the ingredient list for some of the recipes do not match the ingredients on the directions to prepare it. Also, measurements on some items listed are off... for example, instead of listing 1 banana it will say 1 tbsp of banana..... 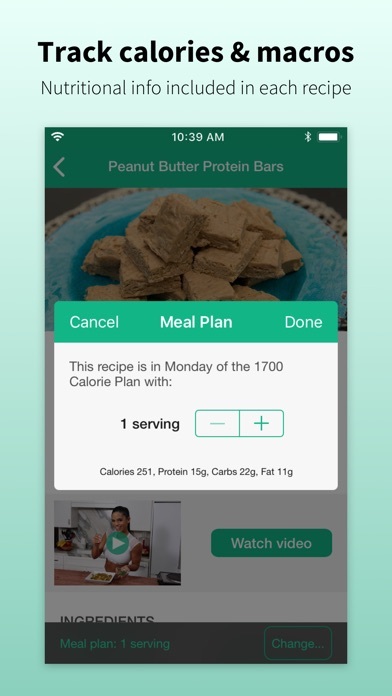 This app has the potential to be exceptional if someone at Mealplan would just go over the recipes and check for accuracy. Googling ‘meal plan’ or ‘meal prep’ gives you better and more accurate information than this app. Haphazardly put together, this app is clunky to navigate and gives contradictory information. Not worth your time or money if you have even the slightest idea how to cook chicken or steam vegetables - that’s as creative as these recipes get. I like the meal plans, but the app needs improvement. I’ve only done 1 week and have already noticed that recipes are wrong. Too many typos. It’s also annoying that they don’t tell you how much a serving size is. I made an entire batch of paleo muffins, but not sure how many to eat each day. Two seemed reasonable, but it still annoyed me. I recently bought the app- I thought it was very affordable considering the content we get! I love the meal plans and “add to grocery list feature” - very helpful!! I also love the “Sweets” category, as that’s where I struggle the most! One criticism - some of the recipes don’t have complete ingredient lists. For example, the instructions will say to add the eggs but no eggs are mentioned in the ingredient list. Apart from those inconsistencies, the app is great! I just want to start off by saying that I am by no means trying to dog this app I am simply giving my honest opinion about it and what I think would help improve it. The bad: One thing that I do not like about this app is that when you generate a meal plan the meals are the same every day. I understand that this might be the case if you were looking to meal prep, but it would be nice if there was an option to have different meals every day or at least some variation. The good: This app is very visually appealing in my opinion and has a very high potential to be really good. It is nice that they have different nutrition specialist so that you have different styles of foods based on a specific trainer. It is also convenient that they generate your calories and macro nutrients based on your personal goals along with weight, height, age, and activity. 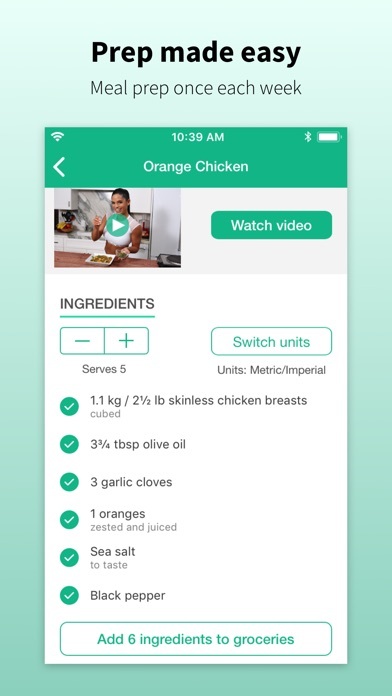 There is also a good amount of recipes available if you look in the recipes tab of the app. 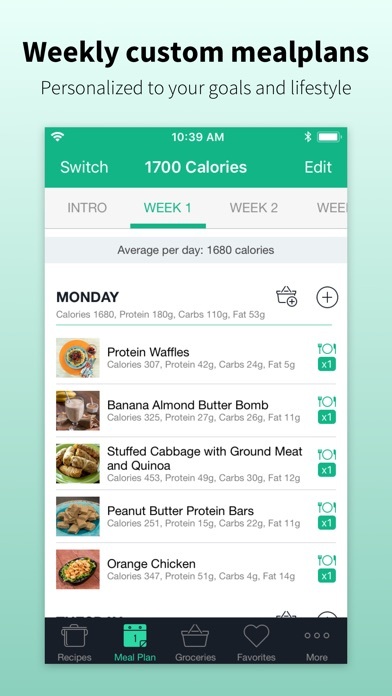 To wrap things up I would say that currently this app is not worth the $9.99 a month subscription unless you are looking to meal plan and eat the same meals every day for a week. I think that if they make the option available where you can chose to have more variation in your meals day to day then it would totally be worth the $9.99 subscription. Love this app! You can select your serving size for 1 or 10. Shows your macros. The recipes I’ve tried are delicious! Well worth the money. Purchased the plan, couldn’t log in due to repeated error messages. Emailed customer support, took forever to respond and when they did they recommended closing the app and reopening it....although in my original email I stated I did that already without success. Send another email advising of the same and still havent received a response. Save your money. Everything about this app is great!! But for the price that your paying for a subscription there is no variety in the pre made meal plans. Eating the same thing 7 days a week would drive anyone to have cravings. Not satisfied at all. Meals had errors and when asked for clarification received no response, when I asked the recipe owner themselves I received bs answers like applause hands and “no need to thank me” when no thanks were given and questions were asked. Nutrition info is off especially on proteins! Serving sizes aren’t always clear either. I feel like this was rushed to release! I want my $$$ back! I absolutely love this app. Whenever I would do meal prepping I end up getting so bored that by day 3 I throw out the remainder of my food. This app has awesome recipes that span the week that are both healthy and easy to prepare. Mason Jar salads? Yes please! I also love that I can choose my macros based on my goals, whether I want to lose weight, maintain or put on muscle. This app will be a mainstay in my life for a long time! I recently subscribed to Mealplan app and am really loving it so far! There’s plenty of recipes to keep your clean eating fun, interesting and never boring. There’s also ways to customize your plans based on your preferences, which helps a ton for a picky eater like myself. I’m excited to report back after using the app for a couple of months, but so far this is off to a great start! I love Mealplan because it takes the guess work out of my grocery shopping and meal prepping for the week. Less excuses to just say “screw it” and order takeout. It helps you eat cleaner and save money. I love Jen and Amanda’s recipes. Hope they add more! Great app, great price. When I first got this app it was a 3.99 purchase with access to a bunch of recipes. But now you have to buy a subscription?? That seems a bit ridiculous to me. Either they should make it free and have a subscription (in that case i would like a refund) OR they should charge 3.99 and have access to the whole thing. I sent out an email once I got the app and I have never heard a response back. They don’t have anything for a vegan or pescatarian person. Never updated the recipes always the same ones. The meal plan is very basic and it doesn’t allow you to delete stuff you do not eat. Not a happy satisfied customer. I have stopped paying for my membership. Wanted to love this app. I am a hug fan of Michelle and Jimmy. And come on. Who doesn’t want a body like hers. I don’t like that I don’t have an option to swap out meals for similar macro meals. I don’t want to eat the same thing for 7 days. Out of all the meal apps this one has to be my favorite and has the most delicious easy, hassle free dishes! 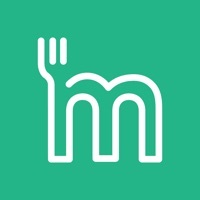 I’ve been using this app recently to prepare healthy food & it has not disappointed my family and friends are so impressed with the meals I’ve created thanks to this app. I must say I especially love the videos. My only con with this app is I would love to see more recipes added soon but overall I love the variety and the subbing dishes that are considered unhealthy with healthier alternatives such as lean beef hamburgers, tacos & delicious snacks. Keep it up and patiently waiting for new recipes. Hoping there are more recipes in the future. Super excited to get started with my he Fitplan and food app. First off, one needs three arepa recipes. The other recipes are unoriginal and lack coherence. The food doesnt lend itself to a meal plan well. Nutritional info is off—for things using protein powder especially, nutrition info can’t be trusted. There are too many low carb/high fat recipes, and not enough variety in macronutrient profile. Why is there a stupid standalone recipe for strawberry jam? And another stupid recipe for marshmallows? Really? Was the recipe/app consultant a first grader? My cookbooks in 3rd grade were more nuanced. 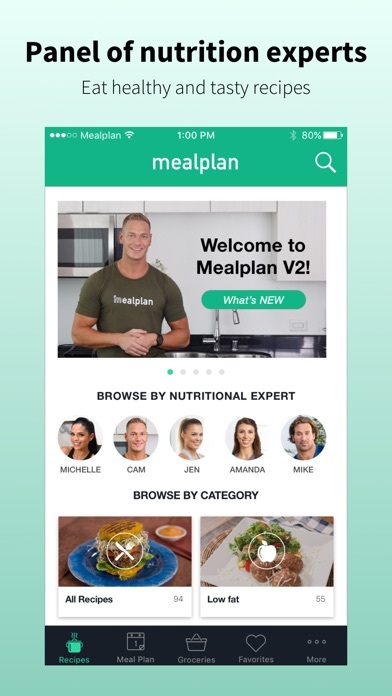 As soon as I got the app I emailed customer support to find out when new recipes were getting added because I was completely unimpressed, and for the past 7 months, supposedly, the new recipes have been in development (at least according to Hannah at Fitplan). There are still just 94 recipes on this app. This app was a waste of money and is only suitable for people who don’t know the difference between parsley and cilantro. I love this app. I've made about 7 things so far and like almost all of them. 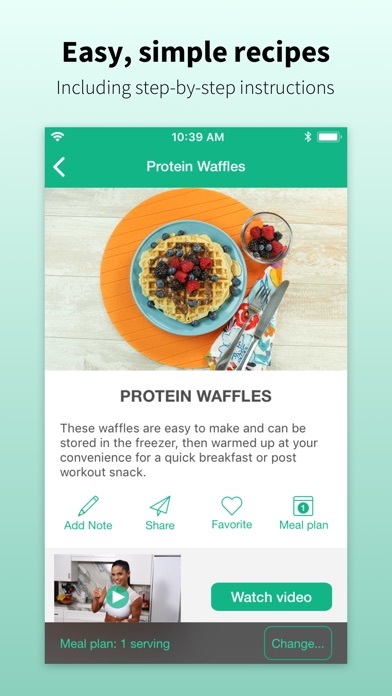 The things I like about this app is: 1) The ingredient list is pretty short and healthy 2) The quick videos make it so much easier to follow 3) The recipes are delicious 4) I love that the recipes calculate the calories and servings for you. I just downloaded the app and was getting started with recipes. However, there are too many variables that aren't being accounted for. In the recipes that call for protein powder, every protein powder scoop varies in size. Having a weight would be the best as I don't want to have to buy a specific brand of protein powder to have the right scoop. The only thing I've tried so far is the waffles and it is thus far proving frustrating. I made Belgian waffles and it made 2; I adjusted the recipe to make 4 but this is what I got. Note: my protein powder has greens in it and these were absolutely disgusting and inedible. I had such high hopes for these. I'm a bit nervous to try other recipes with protein powder but looking forward to others. I upgraded my account for more recipes. I was a little disappointed that the meal plan repeats the same meals everyday for the whole week. I don’t enjoy eating the same meals everyday all week long. The only way you can change them is by upgrading. If I already paid $3.99 for the app I wouldn’t expect to have to pay again. Also, the whole app has less than 100 recipes spread out over different categories. I do like that you can adjust the serving sizes and the units of measurement. Get the foods Michelle eats! I’ve been waiting for this for years and I love it. The meals looks amazing and the way the app is organized makes it really simple use! Already tried the Chicken Adobo and Lemon broccoli with rice. Both AMAZING! Can’t hear anything... But everything looks delicious and easy to make! I am so impressed with the attention to detail and range of dishes. The way meals are categorized is intuitive. It is effortless to determine ingredient measurements for any number of portions. This app is getting the ratings it has earned.